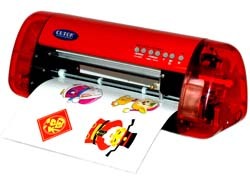 CUTOK DC240/330 is a small cutting and drawing plotter with a registration mark Laser on it. 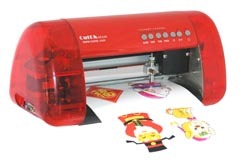 CUTOK DC240/330 is a 9"/13" mini vinyl cutter plotter sign making equipment . You can draw, cut, kiss-cut and decupe shapes around. You can cut cartoon or other Vinyl and polyester sheets for your business and hobbies. It is powered by a 16V DC adaptor. A Windows driver is provided and enables output from leading drawing software (eg CorelDRAW 12, Adobe IllustratorCS). Copyright © 2007 CUTOK | Design by GuoMinTech Co.